I'm a real big fan of hard, milled shaving soaps and recently wanted to try out some soaps that really don't get any airtime on the forums (I recently posted a review of the Baume.be soap, which was a TOTAL DUD!!). In fact, I wasn't able to find any forum reviews on this soap from Bath House. So, in a blind purchase, I ordered the Cuban Cedar & Lime soap. I was half expecting a dud but I was also hopeful that a soap that has been on the market for many years may actually perform well (although we know what the likes of GFT et al have done to their soaps!). Anyhow, upon opening the box, I was greeted by such a wonderful scent! It's not at all simple and one dimensional as the name would suggest. It's a beautiful hit of zesty lime and grapefruit (I am guessing the bergamot contributed to the zesty citrus notes also). These top notes are backed up by very mild spicy notes and slightly stronger wood notes. It is so refreshing and also complex. I really, really enjoyed the scent! The best part is that the scent is the same when lathered up and the scrength also remains when lathered (I'd say it's medium to mildly strong). Now to the performance...to my relief and delight, it lathered up absolutely fantastically! The proto-lather was so thick that I was excited by that stage. I proceeded to face lather and it exploded into really creamy, slick lather. It can take a LOT of water!! I loaded the brush less in subsequent use! Overall, I'm so glad I got this soap and it will always be in my rotation. I also have their Spanish Fig and Nutmeg on the way. I'd highly recommend the soap to anyone! Nav, thanks for the review. Tbh, I’m unfamiliar with the brand. Is this soap vegan or tallow? Spanish Fig and Nutmeg is an amazing scent. There was some buzz about it a number of years ago. Most reviews, unfortunately, said that the scent was better than the lather. Maybe they have improved the formula since then? (10-28-2017, 02:37 PM)kingfisher Wrote: Spanish Fig and Nutmeg is an amazing scent. There was some buzz about it a number of years ago. Most reviews, unfortunately, said that the scent was better than the lather. Maybe they have improved the formula since then? I'm interested. I've been thinking about going back to the classics. Can you post a picture of the ingredient? (10-28-2017, 01:10 PM)chazt Wrote: Nav, thanks for the review. Tbh, I’m unfamiliar with the brand. Is this soap vegan or tallow? It's vegetal, not tallow but i don't miss the tallow in it at all. (10-28-2017, 04:37 PM)Gabe Wrote: I'm interested. I've been thinking about going back to the classics. Can you post a picture of the ingredient? Sure, I'll do that shortly... Just need to remember where i put the box. Usually when a soap's ingredient list begins with Sodium Palmate, the lather is thin, airy, bubbly, dissipating, useless. You're saying this one is an exception and has good lather? (10-30-2017, 03:24 AM)Nero Wrote: Usually when a soap's ingredient list begins with Sodium Palmate, the lather is thin, airy, bubbly, dissipating, useless. That's what i thought and actually, i was expecting it to be a dud soap... But yes, i can definitely confirm it lathers up really creamy and totally stable! In fact, on the first use i overloaded and was stuck adding water and lathering for several minutes to get it to a usable lather! For your peace of mind, i should clarify that whilst i don't have many posts on this forum, I've been using shaving soaps for ten years and currently have a rotation of about 90. This ingredients list is pretty typical for non-artisan soaps; very similar to the TOBS recipe, as well as the T&H recipe. 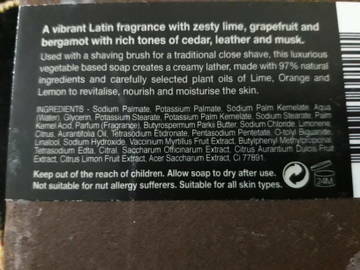 I have never seen a soap with an ingredients list like this that really performed well for me. FWIW, the Pre de Provence No. 66 has Sodium Palmate first, and has no issues lathering. Thank you. That is a deceptive ingredient list. I would suspect a dud as well. I am really intrigued by the scent description. Thanks again for posting about this soap. Me too, the scent description on the packaging sounds delish. Thanks for the review! A reminder for us all to not judge a book by it's cover. I have been tempted by this soap several times, but with two drawers full of unused soap it's going to be a good long while before I allow myself to. Wait haven't we spent a lot of time and threads discussing how the C&E soap version with sodium palmate as the first ingredient to be a great performer? No, always Potassium Palmate is discussed as the good version. (But my favorite, Sweet Almond Oil, actually has Sodium Palmate first. That's the only other "good" Sodium Palmate first soap I know about (other than the PdP no.63, I mentioned above). The baume.be soap is also sodium palmate first and is a complete dud!! I don't believe it's the sodium palmate first that makes it a bad soap. I believe that the formula as a whole was a dud, which happened to have sodium palmate first and this became an indirect identifier. I believe c&e, trumpers, baume etc outsourced to the same manufacturer who had this dud formula. The bath house is as good as the really awesome trumpers old vegetal formula IME. Also, if pdp has sodium palmate first, then there's no doubt that soaps can have sodium palmate first and still be awesome. The first Bath House product I bought was the Spanish fig aftershave balm. It is truly brilliant and my wife calls it " vacation scent! ", Which is top honors in ny household. With that in mind I ordered the Spanish Fig cream and the Cuban cedar lime soap. I had high hopes for both, alas I was somewhat underwhelmed. The soap scent is very mild. Not a problem to lather up storm, but the lather is just about average in terms of slickness. I get better razor glide with Proraso for instance. Same for the cream, which also had changed in consistency in some spots even though the tub was tightly shut. Nice scent, but average performance (below TOBS). I will however re-stock on the balm or get it in Cuban Cedar scent if such would become available. Can we get a picture of the lather? I bought the Spanish fig bath soap just to get an idea of the scent, which sounded really intriguing. I recall being somewhat disappointed, getting more of a one note powdery scent. Anyone try both products?